As of today that would be three, Behind the Red Door, Thorns of an Innocent Soul, and my latest release Nightmares and Daydreams. What other work have you had published? Some of my short stories and poetry are included among other author’s in such Anthologies as “Hope Whispers” “The New York Skyline Review 2008” “WOW Anthology 2008” “Cold Coffee Magazine” second issue, and soon to be released “Another Time, Another Place” from Mythica Publishing. When were you first published, and how did it come to pass? After submitting my manuscript to several publishers, I chose to go with the first publisher that answered back, Publish America. My first novella, “Behind the Red Door” was released in 2005. No, but I’m working on it. At the time I wrote my first two novellas I didn’t really have a clue how the publishing process worked. I didn’t understand that an agents job was to negotiate you a fair deal with the publisher, to make sure you receive adequate royalties and hopefully a nice advance. Currently, without an agent to represent you, it’s almost impossible to get your manuscript in the hands of a traditional publisher such as, Random House, Penguin, Simon & Schuster,etc. Not to say it is impossible to be published without one, several million authors and I have, but I believe I could have received a much better deal if I’d had one at the time I submitted my work for publishing. How long did it take to write your books? How soon thereafter did you see them in print? It took me approximately six months to write each of my novella’s Behind the Red Door and Thorns of an Innocent Soul. 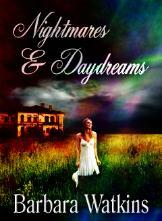 Nightmares & Daydreams is a collection of short stories and poetry I wrote several years ago over a period of about a year. My first two novellas were published quite quickly after the submitting process, within about six months. Unfortunately, they were published in print with formatting and grammatical errors. At the time I assumed all publishing houses appointed an editor to your work and that any mistakes would be corrected before being released – not a smart assumption on my part. Not all publishing houses are created equal, if you catch my drift. Not to take away from my first two books, they both acquired rave reviews for their storylines, but in all honesty, they should have never been accepted with all the editorial mistakes. After hiring my own editor to polish Nightmares & Daydreams I submitted it to a different publisher, which in turn assigned yet another editor to my work before going to print – six months later I had a book in my hand I could be proud of. How do/did you handle writing with children underfoot? I do almost all of my writing late at night – and I do mean late at night! I have six small grandchildren and at any given time, I’m usually watching at least one or more. I write anytime I possible can get a free minute, usually that means while they’re napping, or glued to the TV set watching Spongebob. Thank God for Spongebob! Although, most of my productive work I do late in the wee hours of the night. How much time do you spend writing daily? Weekly? I try to write at least three to four hours every night, including weekends. Recently I’ve taken on some book reviewing jobs and it’s becoming more difficult, but I feel it’s important to write everyday in order to keep a rhythm going. How do you juggle your other responsibilities as a writer (marketing, bookkeeping, etc)? I have a lot of help. My niece, Christy Bradshaw, is my publicist and web designer – my go to girl, so to speak. My sister, Angela Shuffit, is a tremendous help to me by making sure my book keeping is in order, and has scheduled several successful book signings for me. It really is a family affair. What has been most helpful to you as a writer? For me it was joining a writers group. I joined The Heartland Writers Guild shortly after writing Behind the Red Door and Thorns of an Innocent Soul. I attended my first conference in June of 2006 and from the very first minute, I was hooked. These groups are dedicated to educating and promoting published and unpublished writers. I can’t say enough about how important joining a writers group is if you’re looking to perfect your craft. From a financial standpoint, does your writing afford you the opportunity to live comfortably? The average book sells 500 copies. If you sell tens of thousands (extremely decent) it’s still Chickenfeed! By the time you figure in your costs for promoting, deduct agents cut (if you’re lucky enough to snag one) not to mention hiring an editor – well, you catch my drift. Therefore, no, I’m not getting rich, but I am living my dream. Besides, you never know, your next manuscript just might be THE ONE! What more do you hope to accomplish as a writer? As of now, I just finished my first full-length novel entitled Hollowing Screams, a paranormal/psychological thriller. It’s being edited as we speak. Last week I received an e-mail from an established literary agency asking to take a look. Maybe Hollowing Screams could be THE ONE? Any final thoughts for aspiring writers/authors? You can learn more about Barbara Watkins by visiting her website or reading her blog. That’s a harder question than it sounds! I think writers are writers all their lives, but in my case, it took me a little while to remember that is what I wanted to do. I found all of these little stories that I wrote back in junior high, and I realized that somewhere in high school or college, I set writing aside for other pursuits. It was only when I started blogging in 2005 that I remembered how much I love writing creative work. I am doing as much freelance writing as possible, looking for a full-time job in public policy, and also attending the MFA program for creative nonfiction at the New School at night. How long did it take you to land your first paid writing job? And what was it? I took a course at Media Bistro in the fall of 2006 on how to become a freelance writer. It was excellent. I got my first piece accepted by Metro New York a few weeks into the course, and it ran on Oct. 24, 2006. I think I got $400 for a 500 word op-ed piece. I have it framed! Before landing your first paid assignment what steps were you taking to advance your writing career? I took the course at MediaBistro. I also wrote for BlogHer.com, which, now that I think about it, might have been my first paid writing gig. Hmmm…. If given the chance what would you do differently? the same? I don’t know that I would do anything differently. I think I would have liked to understand better how much of freelancing is about how you can sell and promote yourself. That’s not my strength. I’d rather put my energy into the work. Still, I think I’ve been very lucky. A lot of people have really helped me along the way, and I am very grateful to them. Have you participated in any group of writers? If so what role did that play in your success? And how do you choose a writing community (online or face-to-face)? After the media bistro class, I continued to meet with a group of writers. Their support and encouragement was invaluable, as was their feedback. Both women are incredibly talented, so I am very lucky to have met them! We are all in MFA programs now. Who’s been your biggest support system as a writer? Did you have any professional mentors such as more seasoned professional writers in the beggining of your writing career? If so how did you happen upon this connection? The woman who taught the media bistro class, Liza Monroy, was an amazing mentor. She looked at my ideas and my writing in and out of class. Her encouragement was critical – I didn’t think anyone would want my work, but she really pushed all of her students to get out their and pitch, pitch, pitch! What would you say is absolutely necessaryfor any writer to have in place? Support systems – emotional and financial – of some sort. It is hard to make a living as a writer. There’s a lot of rejection. Even when I’m doing well, I’m not earning enough to live on. What’s been the most helpful tool to you as a writer? Writing. I know that sounds weird, but one of my teachers said that writing is generative. The more you do it, the better you become. That is very true. What’s your best advice for beginning writers? Hang in there. It’s a wild ride! You can read Suzanne’s blog over at BlogHer, and to get the real skinny on where to find her, head over to her Blogher profile. Why is it important for writers to understand bookkeeping? Writers are earning money and this money needs to be reported as income on their income tax return. If writers do not have any expenses to claim, their taxable income will be higher and they will owe more income tax. Understanding what can be claimed as business expenses when you are a writer and how to properly document these expenses will help ensure the success of your business. The most important thing you can do as a writer is to become organized. There are many books available on how to organize your writing, but this is the best book available about how to organize the financial side of your writing business. Have you found that freelance writers require a different set of bookkeeping rules? Many bookkeeping rules are universal such as the requirement to record income, but there are some areas of the tax law that are of more interest to freelance writers. This includes dealing with royalty payments, bartering, personal property and agent fees. My book addresses the universal tax rules as well as the infrequently discussed rules that apply specifically to freelance writers. Learning how to document expenses and how to track income will give writers the best chance at overall business success. What are some tax deductions that freelance writers might not be aware of? There are many tax deductions available to writers. Some expenses are common, such as the cost of purchasing a case of paper or paying for a computer software upgrade. Other costs incurred in the operation of your writing business may not jump out at you as expenses when they could be. For example, consider the following accounts. Mileage: Trips made in your vehicle to pick up office supplies can be counted as a business deduction if you record the proper information to support it. Meals: Treating your agent to a restaurant meal with the discussion focusing on your next book can also generate a tax deduction when properly documented. Shipping: UPS charges and postage used to mail a query or review copy of your book can be a small expense, but it should still be tracked. Those small deductions add up and every penny spent as a qualified business expense will reduce the amount of income tax you owe. Bookkeeping Basics for Freelance Writers devotes an entire chapter to expenses including a comprehensive listing of expenses and detailed information regarding what documentation is required to support each one. I’m sure you’ve observed other freelance writers making accounting missteps that cost them time and money. What are some of the most common issues and how can we avoid them? The most common misstep I’ve seen with writers is not taking themselves seriously as business owners. This can lead to financial pitfalls. Many writers have been honing their craft for years so it’s hard to identify an official starting date for their self-employment. Without this point to mark the beginning, it is easy to put off tracking income and expenses. This can be an unfortunate mistake. The IRS will consider you to be in business when you are actively pursuing projects intended to generate income and expenses. This means they will expect you to file a tax return to report those transactions. Keeping track of your income and expenses from day one will enable you to pay the least amount of income taxes on the money you earn. What are some of the challenges readers face with regards to bookkeeping? I found the most common challenge writers face revolves around what they can claim as income and what counts as a tax deduction. For example, if their first job is writing the school newsletter, is the money received really income? Do they need to do something with the Internal Revenue Service before they can be considered a business? How do they handle self- employment tax? The second most common concern for the freelance writers is related to proper documentation. What receipts did they need to save? How should they be kept? What information needs to be recorded to prove the expense? These are all great questions and they are addressed in the book. Obviously, your book is a great place for writers to get information on bookkeeping. Are there are any other resources you recommend? Yes, I recommend writers visit the IRS web site (www.irs.gov) to research specific tax issues and the Small Business Administration (www.sbaonline.sba.gov) for general business information. I also recommend joining professional associations for writers such as American Society of Journalists and Authors (www.asja.org), The Authors Guild (www.authorsguild.org) and National Writers Union (www.nwu.org). There are many groups to choose from so consider the benefits of membership before joining. I was interviewed recently by Freelance Success (http://www.FreelanceSuccess.com) which offers an insightful newsletter for their members. There are also online groups for writers such as MomWriters (http://www.MomWriters.com) offering networking opportunities as well as camaraderie. Bookkeeping Basics for Freelance Writers is available through Amazon.com and my publisher (www.CrystalPress.org). Any local bookstore can order my book by ISBN-10: 0963212389 or ISBN-13: 978-0963212382. List price is $17.95. Brigitte A. Thompson is the founder and President of Datamaster Accounting Services, LLC in Vermont. She has been active in the field of accounting since 1986 and is a member of the American Institute of Professional Bookkeepers and the Vermont Tax Practitioners Association. She is the author of several finance books for business owners, contributing author to two business books, and a freelance writer whose articles have appeared nationally in print and online publications. Visit her online at Writers in Business. I started writing a humorous column for my high school paper in 1977, no longer had anything to say so stopped writing for a while, then resumed after the birth of my severely disabled daughter in 1989. I first tried to get published in 1994. How long did it take you to land your first paid writing job? When I first started getting stories published, I was only paid in free issues of magazines. When I self-published my first book, “A Time to Weep; A Time to Laugh,” I received some money through its sales. When I signed a contract with a publisher for it, I received a $1,000 advance. I was finally paid as a freelance writer for a local magazine after I first offered to do a piece for them for free. What would you do the same starting out your writing career? Join a local writers group. Take a writing course at a local college where I could meet local editors/writers. Did you have help from more established professional writers when you were starting out? I received good advice from writers in my group on editing myself and how to find work. What has been the most helpful tool to you as a writer? Writing what I felt like writing instead of trying to write what would sell. Who has been your biggest support system as a writer? My husband Jim. He puts up with a messy house and very simple meals so I can use my spare time to write. Have you been a part of a community for writers in your career? If so how big a role has that played in your success? I needed my writers group early in my career—you need others to critique your work. Now I just reach out when I need advice. What would you say has to be in place in order to have a successful writing career? Meeting people in the industry is important. You can’t spend all your time behind your computer. I am a full-time writer now for a college because I took a Journalism course there and met the woman who would later offer me a job. What would be your best advice for beginning writers? Find out what audiences want to read and then find a way to write about that while remaining true to your “voice”—your unique way of expressing your thoughts. Only when you have developed an audience can you can branch out and truly say what you want to say. When you write from your heart, really share your soul—don’t write what everyone else is writing. If you lay your heart bare, your readers may just find a kindred spirit in you and feel less alone in the world. Lisa Saunders is a professional writer and author, mother of 2 , and helps educate parents about CMV. For more of her wisdom you can visit her blog online.